Our 1 Ounce White Square Tip Scoop is the perfect way to dispense small food items like candy pieces, nuts, ground coffee and so much more. White scoops are easier to see amid your products and will make serving easier and you can proportion the size with ease. One ounce white flat bottom scoops are handy for home or retail and can hold up to 1/8th cup capacity. The handle is white as well and about 1-5/8 inches long. When you need to get into small containers. Our images are not to scale but give you a good idea of the way this product appears. These white one-ounce scoops will scoop up approximately 28-30 M&M's at once. 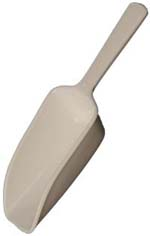 The smallest of small, this flat bottom, square tipped white scoop will stand on it's own. Order your white, one-ounce accessory utensil today!